In my TED Talk, I acknowledged for the first time that, in 2003, I tried to end my life. I wanted to share this in a public setting because 19 out of 20 people who attempt suicide will fail — and those that make the difficult decision to come back to life need openness from their loved ones and a lot of resources. Perhaps that’s what you are in need of right now. JD Schramm: Break the silence for suicide attempt survivors My journey cannot be your journey. And while there are probably great gaps in our specific experiences, there is likely some overlap too. In the process of thinking about my experience, a few themes have emerged which I think have a more universal application. If you have others, by all means add them to the list; if some of these do not work for you, then simply attempt the ones which do. Live Simply. Avoid the material trappings of a fabulous life, but rather find joy in simple things – walks on the beach, instrumental music, or fresh flowers. Choose what works for you. For example I shared an apartment with a roommate, rather than trying to buy a place or live alone to keep my life simpler. Cultivate Sacred Spaces. Have a corner of your room which is ideal for reading, journaling, praying or meditating. Find a church or temple or park or art gallery where you can go easily in the midst of a pressure-filled day to “recompose” yourself. Journal Regularly. This has been vital for me; I have a friend who, at the very least, jots down the time he goes to bed. Sometimes he can get another word, or sentence, or paragraph, or page written… but he’s developed a discipline to at least begin. Don’t just journal the bad, but record the joys and the progress. I often paste simple items (ticket stubs, plane tickets, business cards) from the day onto the page facing what I wrote for the day as a visual remembrance. Create Works of Beauty. Whatever moves you: do it. Throw pottery, weave tapestries, take photos, learn to dance – the medium (or how good you are) doesn’t matter, but find a way to get outside yourself regularly. Abstain from Substances. Even if addiction is not one of your issues, I’d urge you to eliminate drugs and alcohol from your first year back from an attempt. It dulls the pain, yes, but it also can steal from you the chance to live fully your feelings. Tackle life’s joys and setbacks head on – without the false help a drink, a joint, or a line can provide. Assemble Your Dream Team. The exact nature of who you need to help you will depend on the issues you are facing. But strive to put a small and committed group of people in your corner to assist you with the physical, social, spiritual, and personal healing which is needed. Be entirely honest with them so that they know your successes as well as your setbacks. Manage your Primary Illness. Whether it is depression, addiction, bi-polarity, an eating disorder, or something else which brought you to the brink of death, it requires your primary and unwavering focus. If you put anything (a boyfriend or job or volunteer commitment) ahead of managing your primary illness … you will likely lose that very thing you thought was more important. Find A Caring Community. Seek out others with similar needs and develop a network you can rely on. Those of us who are in recovery can find this in an AA or CMA meeting, you may need to locate a support group, join a small group at church, or seek an online community of others who get the depths and severity of what you face. Avoid Dating. You need to first get at ease in your own skin before trying to be intimate with another again. If you are already in an intimate relationship, it is often advised to not get out of this relationship until you are stronger. Consider your “relationship bone” to be in a splint and cast for a while. You need to go easy on it until it is strong enough to handle more weight. Earn a Modest Income. Be sure your basic needs are met, so as not to add financial pressures to your life, but this is not a season to be closing huge deals, seeing great raises, or starting new and demanding jobs. In essence, during this season (likely a year or so) your full-time job is recovering your life. There will be time in the future when you can be more dedicated to a demanding job and/or fulfilling career. Comply with Prescriptions. This is especially necessary as it regards anti-depressants. Only reduce or increase your meds under the specific guidance of your doctor. There are terrible tales of patients who begin to recover, with the help of today’s psychiatric drugs, and then feel they no longer need them and simply cease using them and weeks later end up suicidal. These meds have helped millions, but are powerful change agents in our life. Use them with care and strict adherence to what your doctor says. Share your Story Selectively. It is critical that you create trust with others before sharing your story entirely. Certainly be fully honest with your “dream team,” but you may find others (employers, roommates, bowling buddies, even family members) don’t need and don’t want the full details. Eliminate Easy Access to Destructive Means. Get the pills, guns, and booze out of the house. It is imperative that you clean house (literally) while you are in a place of strength, possibly with a trusted friend helping you. Don’t leave a “back door unlocked” which could undo all your good work later on when things get tough. Be Gentle With Yourself. Strive for incremental progress, but don’t beat yourself up over a bounced check or missed appointment. The 12 step literature urges “spiritual progress not spiritual perfection.” All of us who are recovering from a serious suicide attempt are doing a remarkable thing as we reclaim our life. Take heart in your progress, celebrate and rejoice in the small victories. For the first year after my attempt, on the 11th of each month, I’d go out and buy a CD for my collection. Typically show tunes … what can I say? *This excerpt is from a longer manuscript I wrote as part of my journey back to life. I hope to publish the entire story of my journey soon, but wanted to get this out to people now. That’s why I chose to put this out as a blog post first. Reblogged this on brittydiamond's Blog. Pingback: “A failed product of ‘suicide prevention’” | What happens now? Please step down off your pious holier than thou pedestal. I don’t journal. It’s fine that you do. Each of us must find our own path and it’s great that your path includes journaling. Mine does not. Regarding medications, are you aware that people who receive public mental illness services are dying at an average age of 52 and it’s falling, while the general public is living to an average age of 78 and it’s rising. Again, some find them helpful and some don’t. Even those who do use medications should be cautious and try to not use them for an extended period of time because of their danger. I was hospitalized over 20 times, mostly due to suicidal depression. I would feel suicidal and I’d tell a mental illness professional and in their panic, they’d lock me up. I haven’t been hospitalized in over 20 years now. I still feel suicidal, sometimes often but, I no longer get locked up for two reasons. First, because I no longer tell those poor mental illness professionals. They don’t seem to be able to handle it very well and I hate to panic them. Second, because I’ve learned how to cope with my FEELINGS. I can have feelings without going home and acting in a way that is harmful to myself or others. Nowadays, I feel suicidal and I’ll pause and examine that feeling and try to figure out what caused it to come at that particular time. Mostly people feel suicidal because they’re in pain. Emotional pain can drive people to desperation and they may want to end that pain. For some, the pain was due to childhood abuse. For others, the pain may be more current like domestic violence. In any case, I try to help people find ways to cope with the pain. There was ways to learn how to minimize or neutralize the pain without resorting to illicit substances. However, those ways almost always first start with acknowledgement. Don’t minimize the pain of others with platitudes. Rock on and enjoy your life but please understand that others must seek and find their hope on their own path. Reblogged this on All Saint's Workshop Blog. I love this article. Very honest and really great advice for living again. Thank you. 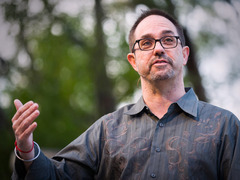 One of the most powerful and moving TED Talks I have ever seen was delivered by JD Schramm. In ‘Break the silence for suicide attempt survivors’, JD gave a very personal insight into his own painful yet ultimately triumphant journey. Now in this blog, JD talks about his decision to ‘come back to life’ and the themes that have emerged which have a universal application. I hope you find it as useful as I have. Thank you for sharing this story. I hope this is really helpful for someone who is in need. If this can change at least one person, the post is successful. A lot of this helps when being depressive too. I never attempted suicide but have had a major burn out about 10 years ago. It’s difficult to say what caused it but wanting to much (not only in a material sense) might be part of it. A lot of the things you mention became part of my life and made it much easier to live. Most important thing though is seek professional help. You can’t do it alone. This story was so compelling, raw, and honest, that I just had to share. I hope it reaches someone who needs it. Thank you so much for sharing. I agree with what you’ve stated on so many levels. All my best to you. May you continue to experience joy and move forward. Very moving and very brave to share. The TED Talk is very powerful too. Thank you, JD.